EURUSD has formed another consolidation range and broken it upwards; right now, it is still moving upwards. 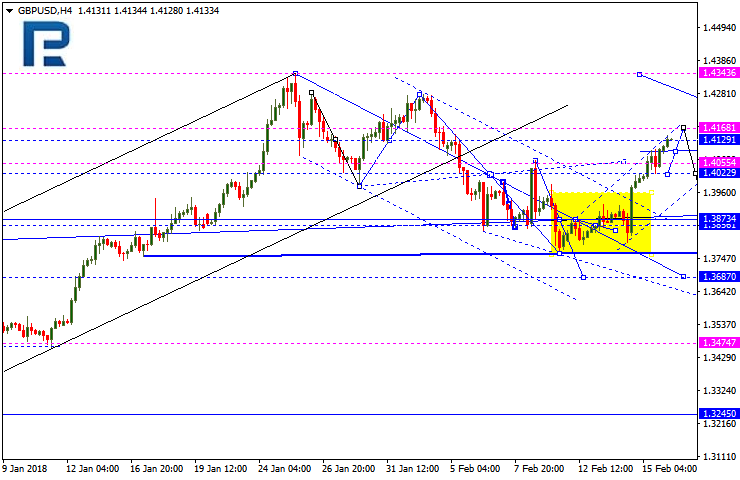 Possibly, the price may reach 1.2562 and then fall towards the downside border of the range at 1.2457. If later the instrument breaks this level downwards, the market may start the first descending wave to reach 1.2337. However, if the instrument rebounds from 1.2500 and updates its highs, the market may grow with the target at 1.2630. GBPUSD is still moving upwards. 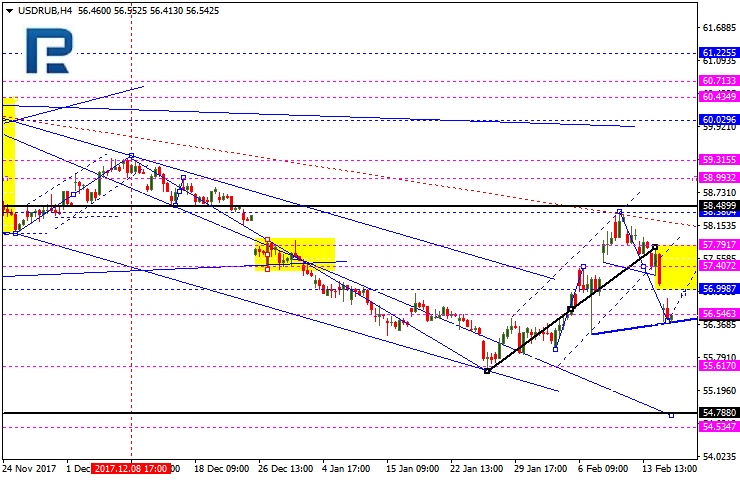 Possibly, the price may expand the range towards 1.4168 and then fall to reach 1.4022. If later the instrument breaks this level downwards, the market may resume trading to the downside to reach 1.3873. 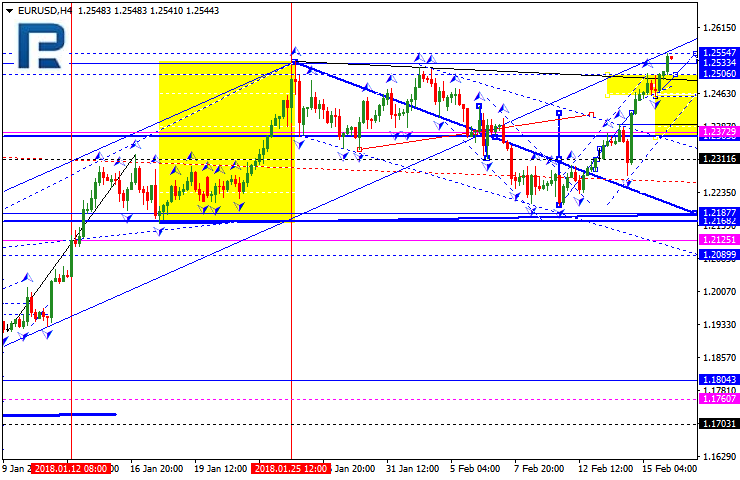 However, if the instrument breaks the high, the market may continue moving upwards with the target at 1.4246. 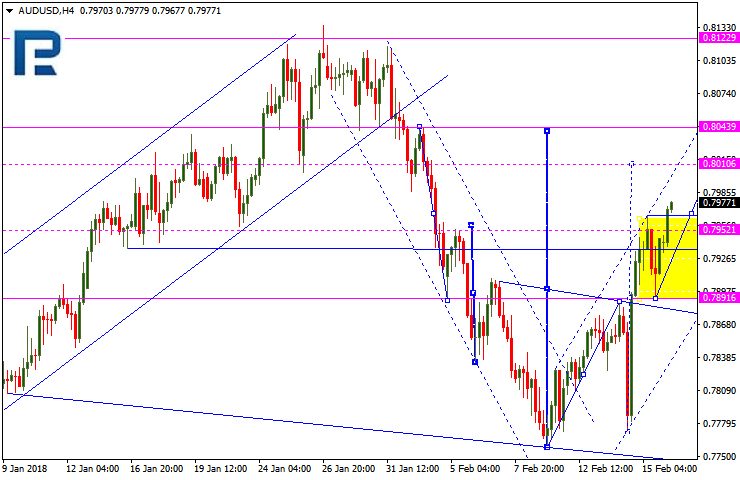 USDCHF is moving downwards; it has expanded the range towards 0.9180 and then reached 0.9272. If later the instrument breaks this range to the downside, the market may continue falling to reach 0.9082; if to the upside – resume growing with the target at 0.9360. USDJPY is moving downwards. 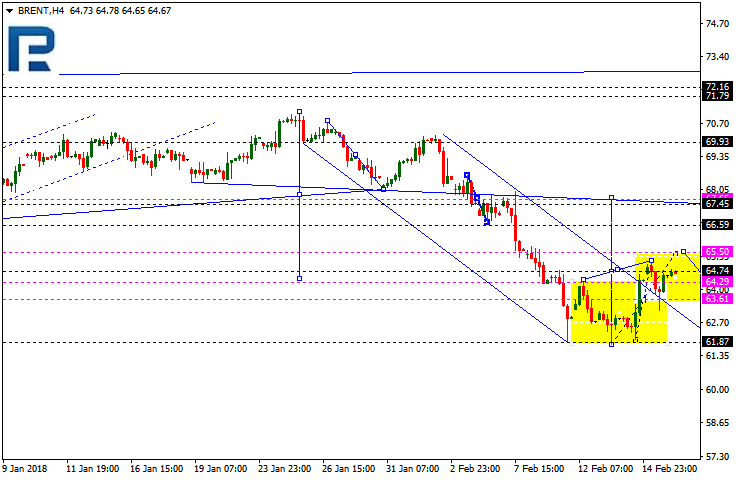 Today, the price may extend the wave and reach 105.50 and then grow towards 106.84. If later the instrument breaks this range to the upside, the market may continue moving upwards to reach 108.20; if to the downside – resume trading to the downside with the target at 104.20. 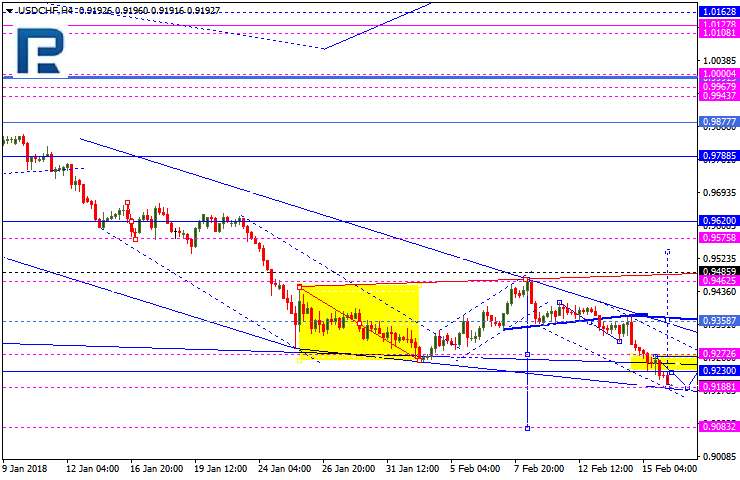 AUDUSD is moving upwards; it has broken its consolidation channel to the upside and may grow to reach 0.8010. After that, the instrument may fall towards 0.7891 and then start another ascending structure with the target at 0.8050. USDRUB has reached the target of the first descending wave and formed another consolidation range. If later the instrument breaks this range to the upside, the market may start another correction to reach 57.80; if to the downside – continue trading downwards with the target at 55.61. 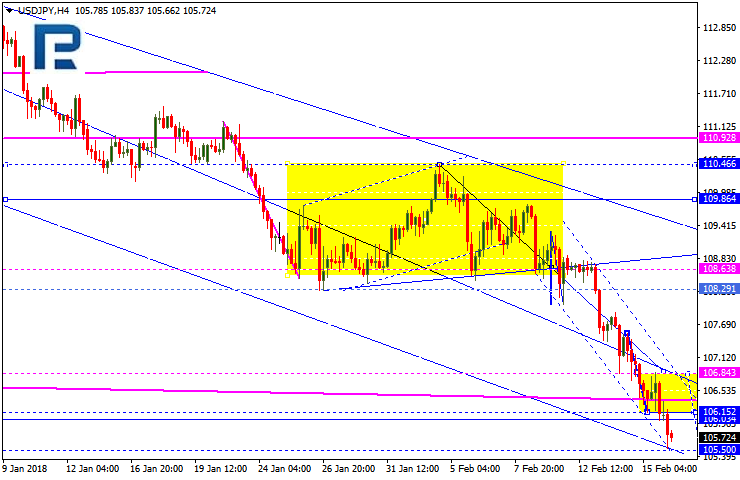 Gold has formed another consolidation channel and right now is trying to break it to the upside. 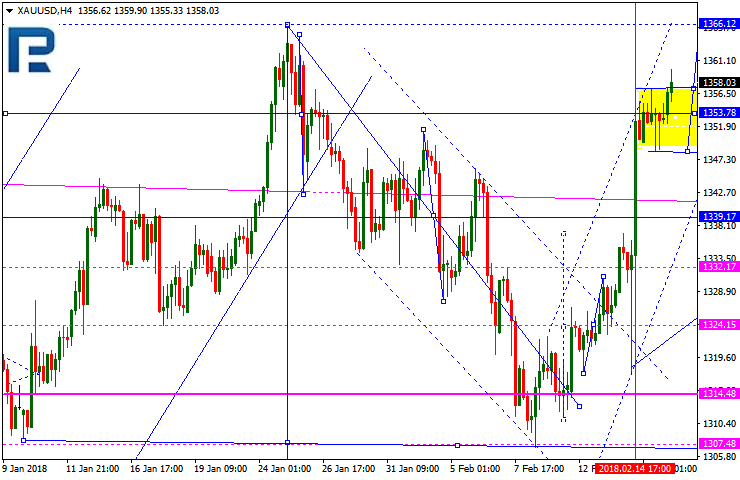 If it succeeds, the price may grow towards 1366.00 and then fall to reach 1349.00. In case the latter level is broken, the instrument may continue falling with the target at 1322.00.